you can calways make a vintage-y hanging bundle of... something. Honestly, I have no idea what to call this thing - ornament? Yeah, or whatever. It was a whole lot of fun to make though, and it will probably be perfect for brightening up some dull door knob in my farmhouse, or maybe I will hang it from the tile stove damper. All the supplies come from Scraplagret. so cool! I totally admire you girls who can take all those individual baubles and turn them in to something amazing like your "ornament". It rocks! I just love your style Jenny. I can't pull it off to save my life, but so admire it :) Congrats on the LSS, hope they're able to carry everything you love. How was the b'day party? Pix to show? Beautiful thingy! It'll spread gorgeousness wherever you put it! I like your vintege-y hanging thingy! 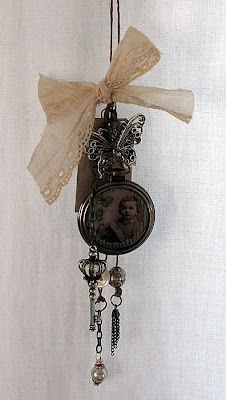 It is very cool and I am sure it will look fabulous where ever you give it a home!